What a great weekend in one of my favorite states, North Carolina teaching the PRI Integration for the Home course! I can't decide if it was the beautiful fall weather or just the beautiful people and that Carolina hospitality that make coming to this area so special. Thank you Craig Kerbo for all your tireless efforts making this course happen and for being such a gracious host. And thank you to my good friend and PRI faculty member, Jen Poulin, PT, PRC for joining me as the lab assistant. We were blessed with a great mix of brand new clinicians and also PRI experienced therapists, including 4 PRC's! The focus was on breathing and alternating reciprocal gait, with special attention given to inhibiting the Left AIC to maximize left stance time and to improve balance to decrease risk of falling. Saturday evening several of us enjoyed a nice evening in downtown Greensboro and were happy to find the statue of General Nathan Greene, because he is likewise focused on maintaining Left AIC inhibition longer in late left stance to optimize his gait. We recently did an interview with Chad Beckman about how he got into PRI and how he incorporates PRI into his personal training. To read the full interview click here. Chad Beckman completed the Postural Restoration Trained™(PRT) credentialing program though the Postural Restoration Institute in 2013. He is a personal trainer at Gold’s Gym in Lincoln, Nebraska. Chad is a Certified Strength and Conditioning Specialist (CSCS) through the National Strength and Conditioning Association. He is also a Performance Enhancement Specialist (PES) through the National Academy of Sports Medicine. He is certified through the National Council of Certified Personal Trainers (NCCPT) through Gold’s Gym. Chad received his Bachelors of Science degree in Sports Management form Peru State College. He specializes in identifying pathomechanics that limit the body to perform at a high level. Chad works with all ages of individuals and excels in teaching sports performance programs, corrective and proper technique, and how to develop efficient motor abilities to perform desired motor skills correctly. The cortical, pre-frontal lobe and temporal power that was in the room at this last weekend’s course in Phoenix at East Valley Spine and Sports Medicine was unbelievable!! The 25 class attendees had close to 200 PRI courses behind them. Some of them had taken 15 to 16 courses prior to this one. We rolled through TMCC with constant and consistent integrated thinking that will help with the revisions that will be made for the upcoming Cervical Revolution: An Integrated Approach to the Treatment of Patterned Cervical Rotation, being taught in early 2015. Thank you East Valley Spine and Sports Medicine for a wonderful weekend of cranial “ expansion” and for your ongoing hospitality over the years with all the PRI courses you host! Author's Note: The following is an article I wrote for my blog, Integrative Human Performance. I intend to turn it into a three-part series aimed at introducing patients and professionals alike to the basics of PRI. Click here to view the post in its original format. If you’ve worked with, talked to, or read articles by myself in the last few years, then you’ve inevitably heard me discuss or reference the Postural Restoration Institute. While PRI has become quite popular in many circles within the physical therapy and strength and conditioning fields, there are still many practitioners and non-experts alike who have not heard of it or don’t fully understand what it is. So, I’m going to do my best to introduce PRI, explain why I find it useful, and discuss how I implement it in my programs. Due to the abundance of information that this entails, I’ve decided to split this into a three-part series; this first installment will cover the history of PRI as well as the neurological foundation on which it is based. If you think back to your high school or college anatomy class, you might recall that there are a bunch of subdivisions of the nervous system. The first subdivision is made up of the Central Nervous System (CNS), which consists of the brain and spinal cord, and the Peripheral Nervous System (PNS), which consists of all of the nerves and ganglia that lie outside of the brain and spinal cord. Depending on the source, you might see the Peripheral Nervous System then subdivided into sensory and motor divisions, with the Autonomic Nervous System (ANS) being a further subdivision of the latter. This isn’t entirely accurate, however, since the ANS does contain sensory afferents. In fact, the parceling of the ANS into the Peripheral Nervous System is also not exactly correct, since the cell bodies for some neurons of the ANS reside in the gray matter of the spinal cord. In addition, the executive control of many of the functions of the ANS belong to the medulla in the brainstem, while regulatory control belongs to other structures of the limbic system. In order to appreciate the wide-ranging physiological effects that the autonomic nervous system has, it is important to understand that there is significant interplay and overlap between it and what are traditionally considered the Somatic Nervous System–the division of the PNS typically associated with voluntary movements of skeletal muscle–and the Central Nervous System. Pelvis Restoration Course Review from Portland, Oregon! The Portland, OR Pelvis Restoration course was awesome this past weekend! Clinicians appreciated the pelvic inlet and the importance of its position during stance and swing phases of gait. This position is imperative for synchronizing respiratory and pelvic diaphragms....without that can you say neck, shoulder, hip, knee, and foot instability. Thanks Shine Integrative Physical Therapy for hosting! Bonus for me? I got attend a PRI Yoga session. Fabulous!!! Thanks Emily and Alice. 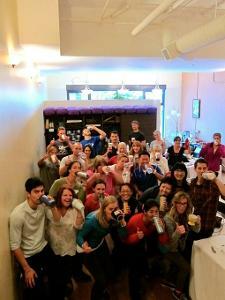 Thanks course participants for your inquisitive minds and as James says "drinking the PRI kool-aid!" Pelvis Restoration Course Review from New York City! I am not sure where to begin with this course in review! First I was blessed to share some extra time in the Big Apple with my husband Chris! This October, we celebrated 15 years of marriage and it has been an amazing ride. This was my last course of 2014 and only my second Pelvis Restoration course of the year. 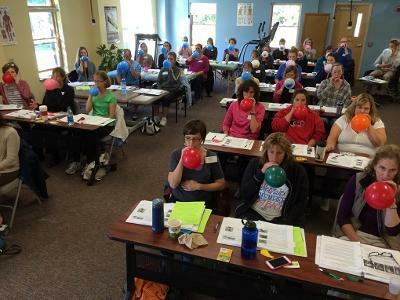 I so thoroughly enjoyed teaching the course attendees all about the power of respiration as it relates to the “Diaphragmssss” It was a year of AFIR and Myokinematics, but this past weekend was a nice divergence to the IPER and IsPIRs of the Pelvic Inlet and Outlet. It was great to help the course attendees connect the dots from Myokinematic Restoration and Postural Respiration with Pelvis Restoration. We had a great time discussing patterns and how it is important to move in and out of patterns through life. This concept resonated with the entire class! My class also had a record number of PT students. It is so refreshing to share in their enthusiasm for learning. Here’s to Brynn from Finish Line Physical Therapy for being a great host. I have made so many new PRI friends this past year and that makes all the sacrifice of travel and being away from my family all worthwhile! I have enjoyed visiting cities like Boston, Dallas, Indianapolis, Montreal, Madison, Canton, Pittsburgh, Cary, Tampa Bay, Seattle to name just a few. Until we meet again #PRINATION, looking forward to taking a seat and a nice winters rest. See y’all in 2015! We recently had a request to purchase the PRI logo balls that we recently started sending to the host site's of our Myokinematic Restoration courses.These are great for adductor pullbacks and the 90-90 hemibridge and many other non-manual techniques that are listed on our n Non-Manual Techniques CDs. We now offer them for sale at $2.00 per ball plus shipping. If you are interested in ordering you can download an order form here and either email it to us at info@posturalrestoration.com or fax it to us at 402-467-4580. Minimum of 10 balls per order. What a weekend in Vermont last weekend! The leaves were changing and it looked like fire on the mountains! The course was Myokinematic Restoration and the group was fired-up as well! Or as we say in Georgia: “Phard Up!” We had some great “ah-ha” moments (I know because I asked!) and, as usual, I learned a bunch of new stuff as well. It never ceases to amaze me about how little I know. I’m constantly reminded of it when I get to listen to some of the clinicians across the country. Thanks for the education and a special thanks to my dear friend Holly Spence who always makes me feel so very welcome. Special thanks to her mom and dad, Charley and Carol Spence for inviting me out to the farm. They knew how to make an old hunter feel at home and welcome. Charley, thanks for the tour of the sugar house and thanks for the pie. I love gluten!!! It was fantastic to be back in Salem for another great PRI Integration for the Home seminar with the awesome staff from First Call Home Health. Thank you Jacob Mullin for hosting another fantastic course experience and once again, thank you for the yummy FroYo. I can't get enough of that stuff. You always treat me so well. I was honored to teach the affiliate information to your staff, but was equally blessed to have learned so much myself from their insights because so many of the group have extensive experience with PRI and with the Home Integration material. Mellet, I was especially impressed with your commitment to mediastinal expansion to obtain and then maintain a Zone of Apposition with each of your patients. Your commitment to sagittal plane integration early in all of your patient programs taught us all which plane holds the key to frontal and transverse success with PRI. Thanks for treating these geriatric home health patients like the athletes they really are. #PRIHomeIntegration #EveryAthleteGrowsOld.